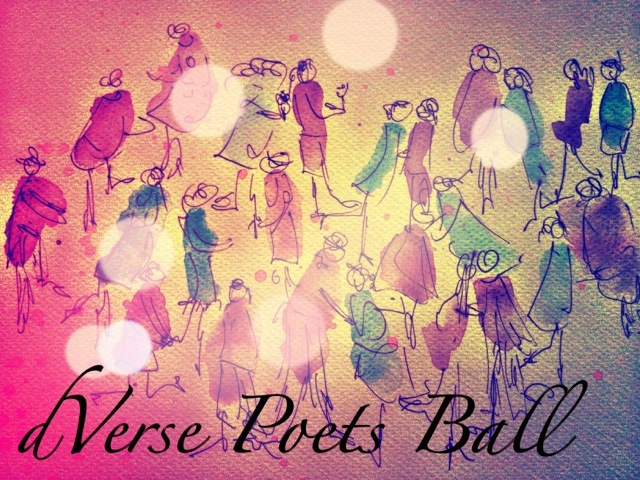 how are we gonna celebrate, Poets ball, The Poets Ball, we sure have written a lot of poems, where are we? Whew… hey Bri… that’s a crazy place for a ball….how did you…? Think there’s someone who’s playing the piano? Three years dVerse Poets pub i– wow– quite a reason to celebrate – are you glad that we didn’t give up a while ago? I am glad. We have settled into a nice rhythm now — not so taxing….and we have such wonderful friends in quite a few of the poets. Its good to have a place we can gather and converse over our poetry. Smiles. Did you think we would still be going at this point? We wouldn’t if we didn’t have such an awesome team I think…What are the things you like most in the pub? Oh it is def the people. A place is a place, but add people and it gains gravity. Keeps you wanting to come back. So I would say the poets…and our pubtenders. Reading their poems and prompts, you really feel like you get to know them…and just look forward to being around them. hmmm…I’m excited… what do you think – should we place that Buffet table over here… ? Definitely, that way people can look up at the stars as they fill their plates. Wonder what the chefs have in store for us? I wish that Dave could celebrate with us – think he’s watching from above? We’ll have an around-the-globe buffet tonite – right? Do you think Tony is going to bring Haggis? Think I go for Sari – a friend of mine showed me once how to wrap it..
Love me some Indian food…wonder what other exotic dishes we will have…oh I think we should stop talking about the food, I am getting too hungry for my own good…ha…. At midnite we could fold lantern boats and let ‘em float down the stream… what ya think? Oo, maybe even do sky lanterns like they do in thailand….we could set the world to light no matter which way you look….smiles. So what exactly do we want people to write? Tuesday is our Pre-Ball Celebration. I am sure everyone will be a bit excited so let’s talk about who they look forward to seeing. Maybe an Ode to Poets, or even a tribute to a specific poet at the pub that has made an impact on their writing and or life. It would be hard for me to choose just one, so I might do one to the poets en masse…ha. That would be really cool. Maybe they can use those poetic imaginations to see themselves at the ball. Maybe some will write about the food they are bringing. Ha. Did you order the crab legs? Seriously, we need to stop talking food until the ball. Lol. Do they have to write in a specific form? Oh, no. You know me and form. Ha. But if you remember, our very first prompt, before we even opened was to write about a pub…now that we have been in one for a while I think we should revisit it…Smiles. Hey, we can’t give away everything the first day can we? I guess you are right. Alright, let’s finish getting things set up, people will begin showing up soon. happy anniversary…. dances around the living room – i LOVE that we can celebrate the pub’s third birthday!!!! how awesome is that!! seriously…not sure we thought this far ahead with those first emails we were shooting back and forth…smiles. ah well i was thinking about you as i watched…ha. Three years has flown by! looking forward to many more great articles/promps/motivation. Thank you to all for your inspiration!! flown by indeed….here’s to many more years… good to see you ken! Yay – celebration time. I am so happy dVerse is here, happy you found a way to reduce the workload so you can enjoy the ride……..I love the idea of writing odes……..happy anniversary, kids! heya sherry…thanks for the well wishes…should def be a fun week paying tribute to fellow poets…and to the place we all gather…. A very happy anniversary to dVerse!! Three weeks was a long wait for the pub to re-open. 🙂 Happy anniversary, DVerse. smiles… we’ve cleaned the floor, washed the curtains… but def. time that those doors swing open again! a ball! how exciting…a reason to dust off my mask…oh wait, is it a masked ball…ah, no matter; good food, good music, some dancing, some poetry and some great people is more than enough to celebrate three years. I am definitely looking forward to lighting up the sky. Congrats on three years and a big “Thank You” to you, Brian & Claudia, along with all the other pubtenders, for creating such an amazing and welcoming space. ha. you can wear a mask….actually we considered making it a masked ball and having everyone come up with a mask…ha…. and thank you…its been a fun ride…and def our pubtenders past and present have played a big part in that…. Happy Anniversary, dVerse! So glad to see everyone back, hungry, and ready to write! btw, Claudia, did you sketch the “ball” picture above? Happy Three! Just a baby still! Happy anniversary everyone! So nice to see everyone again! I did enjoy the World Cup this year. The US put up a good fight and really did well in their game against Germany. I was happy about that. But definitely, congratulations to Germany on their victory… Looking forward to seeing what this week brings. Sounds like a fantastic celebration is planned. at least not a blow out like their previous match…ha….. I think you are right Mary, what a gift! i guess in the grand scheme of things…we are still young…ha…thanks annell…. Haggis? Did someone mention haggis? As long as I don’t need to get it into the US … importing haggis is banned … then I can bring haggis. So, who’s bringing the tatties and neeps? … and the whisky, for heaven’s sake! nice….is it really banned….i must have eaten illegal haggis then…. i feel so criminal now…ha…. You guys! It’s no wonder we all love coming to the Pub. For a while there, in the dark moments of a possible shutdown, we had a committee cutting out sackcloth and making ashes. Happy #3. May this next year be as enjoyable for you as you are for us. Bartender! Bartender! A Lemon Drop, please. hey i shaved my head this week so sack cloth and ashes would go well….smiles…. Welcome back! Hope you had a good holiday. Depths of an Aussie winter here (which is not too bad compared with winters in some other countries). I didn’t take much interest in the soccer, I’m afraid. Busy turning collections of poems into books! (Mostly collaborations.) Everything happens at once, lol. Also writing a little non-fiction work for a grand-daughter who is interested in magick but still thinks it’s make-believe. So you see, I managed to amuse myself while the pub was closed, but that doesn’t mean I didn’t miss you all. I am SO looking forward to the masked ball. Of course it’s masked – isn’t it? Does that mean we get to try on the styes/voices of other poets or personas? Ooh, what fun! oh snap…i need to send you a quote….i thoroughly enjoyed the read rosemary and all the different voices of you four…completely slipped my mind when i got home from my trip…. ha…it would be fun to try to mimic the voice of another poet…we may need to log that one for the future…. Happy Anniversary everyone. 🙂 The upcoming week appears to be so much fun. thank you amnol…for adding your voice to the mix…. Congrats! Wishes for a splendid year three …year 4? I’ll be at the Ball to celebrate your anniversary and drink to your health. I’ll bring some Chocolate Babka which goes well with anything! So excited to see the Pub reopen… and a Grand Ball, how decadent! I know I’ve not been here from day one but on & off I have been coming for around 2 years. Some of you know me, but since I am the shy type there is probably many more who don’t. Thank you all for an inspiring warm place to sit & write & connect… I love it. now there is no reason to be shy among friends…ha…. peace & hugs back at you…. Looking forward to new challenges! I checked in a few times because I kept forgetting when we reopened lol. ha. laundry is important for sure….before it takes on a life of its own…glad you took a break to drop in on us bjorn….have fun out there in the wild…..
Björn, I love the idea of Swedish meatballs. Do you have a family recipe? Happy Anniversary!! And a big thank you from me–congrats to all of you out there that work and contribute here–and again, thank you! hope your week is going well…. Looking forward to this wonderful week… my daughter is getting married on Saturday, so I will miss some of the fun, but ya know, I’ll be having a different kind of fun. oh i def think of cheers….wheres norm? ha. as i was considering my ode to the pub for later this week, that is def the picture in my mind…congrats to your daughter…that is awesome!!! are you travelling for the wedding or is it local? Thanks! It’s a bit of a travel, 4 hours away… still can’t believe it’s happening, but I’m really looking forward to it! nice…not too bad…ha. i am sure you will be a teary joyfilled mess…lol…if anything like other moms i know…i hope the day is beautiful…. So glad to know we’re celebrating in Florence. Being there is one of my very best memories. What a beautiful place. Perhaps some piano aria scores from Verdi and Puccini for background music, some great vino and great poetry too. This is an anniversary month all around for me. July 4 would have been my 50th wedding anniversary. This was the 23rd anniversary of the Cannon Texas Open Ice Skating Competition, July 23 is my birthday, and this is 3rd anniversary of d’Verse – what a New Year Celebration in July it is for us all! Looking forward to this week and all it brings! ah well you have one up on me….i would so love to go to florence….50th wedding….wow gay…did not know they allowed babies to get married…smiles…and happy early birthday as well!!! Hoping that all the hosts have had a super-refreshing break. I’ve missed the dVerse prompts, and am looking forward to the ball. I’ve got my glass slippers all polished up…smiles. I think a week of odes might be just the thing for me…my father-in-law passed away (rather unexpectedly) this past week, so a bit of joy will certainly be welcome. woot…i cant wait to see you in glass slippers bryan…haha…. i am sorry to hear about your FIL though…when my MIL passed away a few years ago it was a really hard time for my wife….give yours a hug from me…she will def be needing them from you…. sorry i was a little late replying…we had a nasty storm blow in at 4 that took out power and the net…we have power back but everything else will be by morning….am over across town right now mooching some net to play catch up…. Thanks for all you guys and gals do..to make this volunteer effort happen..a year ago..the last thing i will imagine is that i will be continuing a creative effort now..and there are many things that inspire me in so many ways as a result of this great Poet’s Pub..with all the diversity of thoughts that transpire here! To inspire is to carry on in so many ways…..with the help of ALL others……..in DARK or light…..
in dark and light, indeed…. and thank you for being one of those servers grace….smiles…. So excited, you two. Great intro dialogue. It’s good to be back in the pub after a little break…though it’s been a busy one for me. Have my first poem posting imminently. Got to get cracking on the other and practice my dancing. I love how you mentioned Dave King…I think of him often. And all of our other pub poets. What a great group of people we have…truly “diverse.” And open to one another. oo save a dance for me v….smiles…. Happy Anniversary Dverse Poets. I’m so grateful and honored to know you. This celebration is pretty exciting. I’m having a virtual toast to you. Cheers!! i will toast you back myrna….smiles. oo shine….wow…umm…that stuff will mess you up…ha…. Happy Anniversary! I am so thankful for you all! I will just bring lots of the Bubbly, because it reminds me of celebrating and tickles my nose! Looking forward to sharing the celebration and catching up again…I continue to be swimming upstream. Against a very relentlessly strong current. Determined. Smiles 😉 and hugs. ha. nose tickles can be fun…. was it dory that said…just keep swimming…. So very creative! I hope to bring myself and read all that people have to offer – maybe come up with something, but if not (summer has me running in circles) I still would like to celebrate this awesome blog and the people associated with it. You guys are awesome! smiles… i do hope that you will find time to show up at the ball…though i hear you on the summer business… happy anniversary! thank you beth…and thanks for taking us on a journey this year on discovering our poetic roots…. happy anniversary guys! good to see ya all back. Lean monsoons here and well, i am still coping with new schedules at work and otherwise. It is at such times i wonder how prompts help! gathering the scattered thoughts! hope you all had a lovely break!! more power to the pub, poets and the pen! I’m late at the party – we were having our own here in the village: carneval time. If I’d known we could have had the ball here. The dVerse pub has been my local since the start, but I’d no idea that was three years ago! Félicitations, the pub team – you do us proud each week, stimulate, educate, amuse. Thank you all. oo carneval…what a magical time…thanks viv…and always great to have you in the pub….smiles. I remember that very first Poets Pub too, and even though I don’t seem to have any words right now (they come and go for me, but I hope it won’t be two years this time) I’m so glad you’re still around to celebrate three years! Happy Anniversary! Happy Anniversary to DVerse, to all the devoted people who run it. Those who take the time of out their busy lives, to post prompts, read and comment. You all do an amazing job. I hope to return again soon. In the interim I hope that everyone has a splendid time at the Poets Ball. now go find you some aussie garb & grub and get back here to the ball…ha…smiles. Happy annniversay to all… Lots of love…. Happy anniversary to dVerse team and poets! It will be fun to read what everyone comes up with. I can bring some Greek/Romanian/French food to the party. And I can mix a really good G&T and capirinha! mmm the food sounds wonderful…look forward to seeing you throughout the week marina…. So sorry for my tardiness to the dance, ya’ll. more of those “real life” stumbles kept me away. Super appreciative congratulations to all my dVerse colleagues. Thank you for the honor of letting me be one of the crew. And deep, deep, deepest gratitude to all the wonderful poets who have visited the pub and said hi those nights I wore the apron. hopefully those real life stumbles will be behind you soon enough joe…happy anniversary. Congratulations to all the folks that have made the pub such a fun and exciting place to hang out. Three years, how cool is that? Way to go. I’m pulling up a bar stool ready for the next three. Cheers to that! Happy Anniversary to dVerse..this is such a wonderful place to visit…and I would like to thank all the great people who make this place happen. My creative muse thanks you as well ..sometimes all that is needed is a seed for a dream to grow…I’ll be sure to send some roses your way for the ball.. Happy Anniversary, dVerse! Hugs and love to Brian and Claudia for creating such a great venue for reading and sharing poetry. I’m looking forward to another great year with the pub patrons! Happy 3rd dVerse! and happy writing to all! No poem from me I’m on vacation and storing up for when i’m back home in my quiet secluded spot. Happy days to all! Three years – WOW! – I ❤ dVerse – let's celebrate!